Your business has a great product line that you are selling at a fair price. But if you want your enterprise to reach its full potential, good product features and pricing aren’t enough. 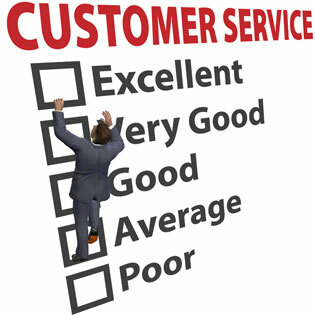 The factor that can boost you far ahead of your competition is providing outstanding customer service. According to McKinsey & Company, 70% of purchase decisions are driven by how the customer feels they are being treated. Great customer service is a difference-maker. Here are some tips about how your customer service representatives (CSRs) can provide outstanding service, and about the kind of IT Service Management system that can help them do so. Like anyone else, customers are drawn toward experiences that make them feel appreciated and valued. Try to make customers feel that you welcome interacting with them, rather than seeing them as an annoying interruption to your day. Always be respectful and courteous. And here’s a tip that can make a real difference: put a smile on your face. Whether you are communicating face to face, by telephone, or even by email or in an online chat session, that smile will affect your entire attitude. Customers will sense that it’s there (or that it’s not) whether they can see you or not. You want your customer to see you as their advocate, a partner in finding a solution to their issue. You are on their side, just as interested in meeting their need as they are. Never take an adversarial stance toward the customer, even if you can’t give them everything they want. Speak positively of what you can do, rather than negatively of what you can’t. Customers hate being shifted around to different people or departments! Frontline responders should be trained and equipped to determine exactly where to direct an initial contact without sending the customer on a round robin of transfers. This is where having a good IT Service Management system can really help. It can provide your frontline responders with the information they need to quickly determine the appropriate landing spot for resolving the customer’s issue. Here’s something else customers hate: being transferred several times and having to restate over and over information they already gave at the beginning of the interaction. Your IT Service Management system should be set up to ensure that pertinent information is always available to the next responder. When it comes to things callers hate, automated customer service systems rank near the top. People want to talk with people, and want to do so as quickly as possible. Running them through a maze of “if this, press that” leaves them frazzled and angry. According to Consumer Reports magazine, 71% of survey respondents were “tremendously annoyed” when they couldn’t get through to a real person on the phone. Customers don’t care about constraints imposed on you by internal rules and procedures – they just want their issue addressed. Following procedure is no substitute for actually helping the customer solve their problem. Give your CSRs as much latitude as possible in accommodating the customer, even if it means going a little beyond strict adherence to policy. Be sure to provide a way for customers to escalate issues when they are not satisfied with the response they are getting. Many companies now make it almost impossible to get a supervisor involved, and will even directly refuse customer requests to do so. This very frustrating practice comes across to the customer as stonewalling, and can kill any possibility of a positive relationship. Make it easy for the customer to file a complaint. And make it clear to them that you have a formal process to ensure that their complaints will get attention by the appropriate authority in the company. Even better, be able to assure them that they will get a quick response from someone in the organization who can tell them what is being done about their input. Always do what you say you will do! If you tell a customer someone will call them back within a certain period, make sure it happens, even if it’s only to say you’re still working on their issue. Don’t leave them hanging, wondering what, if anything, is happening. This is a matter of fundamental integrity. Once a customer’s trust in your company’s integrity is lost, it is very difficult to restore. This is another place where a comprehensive IT Service Management system can help. It can provide notifications to your customer service team when a response or action has been promised, and who in the organization is responsible to make sure it happens. Customers really like to get help when they need it, no matter what time of day it may be. If you can’t staff for 24/7 telephone access to a customer service representative, be sure you have some kind of online immediate-response self-service system. This may be an automated trouble-shooter, or perhaps a customer service chat capability. One of the most frustrating experiences for customers is dealing with service representatives who clearly don’t really know what they are doing. To keep your customer service team sharp, they must not only receive comprehensive training at the beginning of their tenure, but must continue to have their skills honed on a regular basis. In particular, as your IT Service Management system becomes more sophisticated over time, your CSRs will need regular retraining in how to use that technology to give great customer service. The 2011 American Express survey found that Americans tell an average of nine people about good customer service experiences (and sixteen about poor experiences). Your customers are talking about you, and you want what they say to be positive. The most powerful advertising your business can receive is an unsolicited testimonial from a satisfied customer. Outstanding customer service can push your business ahead of the pack. Implementing these tips will help you get there. If you’d like to explore how a IT Service Management system can give your enterprise a leg up in providing great customer service, please contact us.